Huawei’s subsidiary company, Honor, is launching a new device in Paris next month. And this will reportedly be the Honor View 20. So, what’s special about the phone? There is no notch, or a pop-up lens. Instead, the selfie lens will be placed in the left corner of the display. That’s right, the Honor View 20 will feature an in-display camera. The news was announced by Honor PR Manager, Bhavya Siddappa, on Twitter. 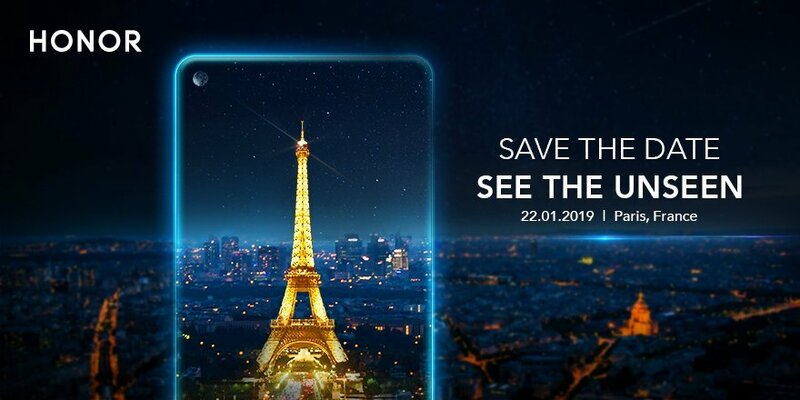 The Honor View 20 will be announced on January 22nd, in an event in Paris. That’s why the Eiffel Tower is used in the press render. But if you observe closely, you can see that Honor has done some clever work with the photo. The Honor View 20 in-screen selfie camera is shown like the moon in the starry sky background of the photo. Details about the phone haven’t leaked yet, but word is that the Honor View 20 will be powered by Huawei’s flagship chipset, the Kirin 980 processor. Interestingly, the Honor View 20 won’t be the World’s first in-screen camera phone. That honor (pun intended) will be Samsung’s, because the Galaxy A8s with an Infinity-O display is set to be launched in China, on December 10th. The Huawei Nova 4 which is scheduled for a December 17th launch, will also be equipped with an in-display selfie camera.